Scheduled PDF reports are a great way to keep your team, company, and investors aware of the most up-to-date numbers and key performance indicators. The report is a PDF image of your dashboard. In Grow, you can set up PDF reports and have them automatically send to multiple recipients on varying intervals. Note: Email reports and PDF reports refer to the same feature. PDF reports can be scheduled for any of three intervals: daily, weekly, or monthly. Additionally, if you have customers in different timezones or different people want it at different times, you can set multiple reports for one dashboard and pick the timezone and send time for each. Daily PDF reports can be sent at any hour of the day. Weekly reports can be sent on any day of the week at any hour. Monthly reports can be sent on any day of the month at any hour. If you pick a day that doesn’t exist in the month (i.e. the 30th and it’s February), the report will send to the day that is closest to that (i.e. the last day of the month). The dashboard will be updated as close to sending as possible. Previously, the dashboards updated at 1am, then the report sent at 6am. Now the system tracks how long on average a metric takes to update and refresh, so it will try to update it as close to sending time as possible. All reports that existed previous to the update to schedule your reports are still being sent at 6 a.m. Mountain Time. If you want to adjust that time, you can do so in your settings. Previously, in order to send a test report, you had to add the email to a report, send the test, then remove it (in order to not get the regular report). Now, you can send a test PDF report without having to change any report settings. To do this, click the Send Test button. This will bring up a window where you can enter a test email address and send a test report. In order to create PDF reports, go to your account settings, then select Reports from the left-hand panel. This will bring up a full list of reports for your organization. If you are looking for a specific report, use the search bar at the top to search for it. To create a new report, click the white/blue New Report button at the top right corner of the page. On the new report page, you can set different settings for your dashboard. At the top, select the dashboard you want to create a new report for from the Dashboard drop-down list. Under Delivery Schedule, select which interval you would like to send this report on. If you choose Weekly or Monthly, be sure to select which day you would like to send it on. Next, choose the time you’d like it to send and the timezone. The timezones are organized alphabetically by continent, then city. You can use the search bar at the top to find your timezone. Below the report details is the Recipients section. Enter the email address that you want the report to send to, then either press enter or the Add [email] button that appears below the email field. To remove an email from the recipients list, click the x that appears when you hover over the recipient. When you are done, be sure you click the blue Save button at the top of the page. You can also set up a new report from the Dashboards tab in settings. Once you select a dashboard, the Reports Summary appears below the dashboard settings. This gives you a summary of the reports scheduled for that dashboard. To create a new report, click the blue + New Report button in the right-hand corner of that section. Grow has a handy feature that allows you to manually generate a PDF Report of your dashboard. In order to get the PDF, log in to your Grow account. From the options menu in the upper right-hand corner, select Generate PDF. The PDF will open in a new tab in your browser, where you can download it. Sometimes, you click the button and it gives you the message "Success! PDF generated." but nothing happens. This is usually because pop-ups have not been enabled for Grow's website in your browser. At the right end of the URL bar, a short message and symbol will appear, indicating that popups have been blocked. 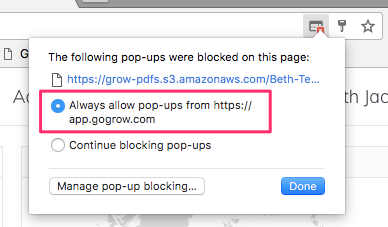 Click the blocked popup notice or icon and select "Always allow pop-ups from https://app.gogrow.com", then click the blue "Done" button. (This is shown for Google Chrome. The process is similar for Firefox.) You will only need to do this once. 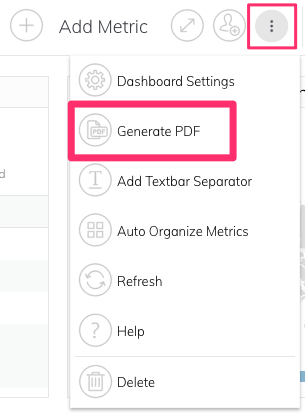 Go ahead and click "Generate PDF" again. After you allow pop-ups, the tab with your PDF will open automatically. If you would like your PDF to be in Dark Mode, you can set that on the dashboards settings page. Now all the PDFs that are generated will be in dark mode.